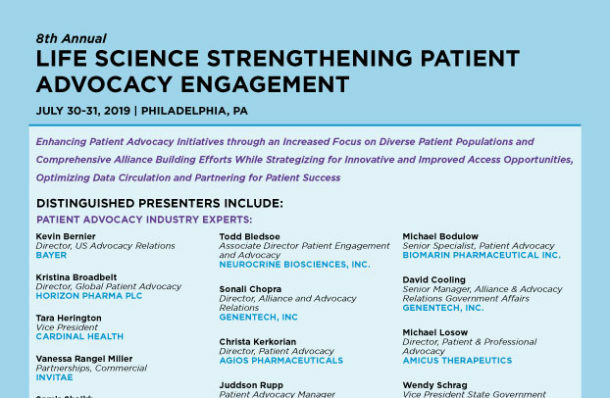 Advocacy executives engaged in strengthening patient engagement efforts are working to increase representation and collaboration between manufacturers, advocacy groups, and patients. To highlight the patient voice, promote positive efforts within the advocacy landscape, and establish methods for defining and communicating product information to patient communities, manufacturers and advocate groups are partnering to increase communication with patient communities and establish avenues for access to products amidst challenges. Due to the significant access obstacles that patients face, advocacy roles have become increasingly significant in effectively communicating patient needs. Establishing a well-developed, patient centric approach is accomplished by employing innovative methods and developing the patient advocate role internally and externally. In the 8th edition of the Life Science Strengthening Patient Advocacy Engagement Conference, participants will have an opportunity to exchange best practices with manufacturers and advocacy professionals by participating in deep-dive case studies and engaging group discussions which highlight the extensive growth that has taken place in this evolving patient advocacy landscape. Panel discussions will also play a critical role within the program, providing participants with an opportunity to engage with colleagues and learn from peers in a structured, dialogue-based format which seamlessly blends education with professional networking.